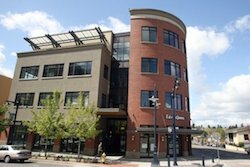 Wow, another credit union for downtown Bremerton. Why do both Navy Federal and Kitsap Credit unions ignore the south end of Kitsap County? Neither credit union has a office or ATM in downtown Port Orchard. What are both credit unions planning for the south end? I can not imagine needing to take the roads in Bremerton to get to either downtown credit union. Between red light cameras, poor coordination between lights, and the parking enforcement it would be easier to just go all the way to Silverdale or Gig Harbor.